"Quality Plants At Reasonable Prices"
blooms in the fall. Very Showy! This select clone was awarded in 1999. Emerald green sepals and petals with a nearly black callus on the lip. Unusual and rare. This species has a 1" wide spiraling, metallically shiny ox blood colored rachis, that bears its small beetle like flowers along its side. Flowers have a rocking lip. Bloom spike will reach up to 16" tall. Very showy. Clusters of 1" + yellow and orange flowers with an orange lip. To assure a good spring blooming withhold fertilizer and water after November and let them get cold (40's) at night. 2" Yellow with orange flowers with a definite "Root Beer" fragrance. Plant flowers whenever new growths mature. Narrow segmented 1 & 1/2" pale yellow flowers with a red tip and a red lip at the beginning of each flower which is hinged and rocks with the slightest of breeze. Flowers cluster into a half a daisy-like pattern. 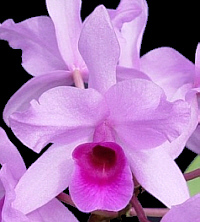 "The Lady Of The Night Orchid". This wonderful species is fragrant at night. Filling your growing area with its wonderful scent. We have crossed two of our awarded scriptum together for more great plants of this high quality Measurianum variety of scriptum. 3" green flowers with mahogany spots on a 5 foot spike. These are nice large plants. This species has 4-5" flowers heavily spotted with maroon. 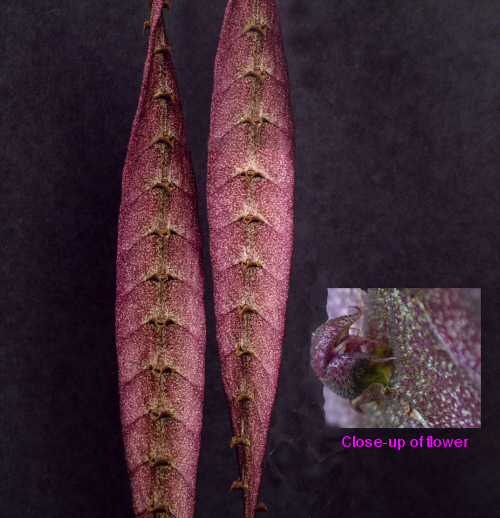 The dorsal sepal has purple tassels. The lip is hinged and rocks in the breeze. 3" Golden yellow mop heads hang off each bloom spike. Plant grows great and makes a spectacular specimen plant. This north India species has 1" rose colored flowers with its fringed lip, orange surrounded by white. 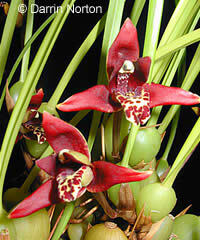 Native to Central and South America down to Brazil, this easy to grow species blooms twice a year or more. Waxy 1" reddish flowers nestled within the foliage, produce an intoxicating fragrance in the spring. Phal. violacea This violacea cross comes from our friend Eric Huhta. Some items are in short supply and may sell out quickly. Please indicate on our order form if we may substitute a similar item or pot size.